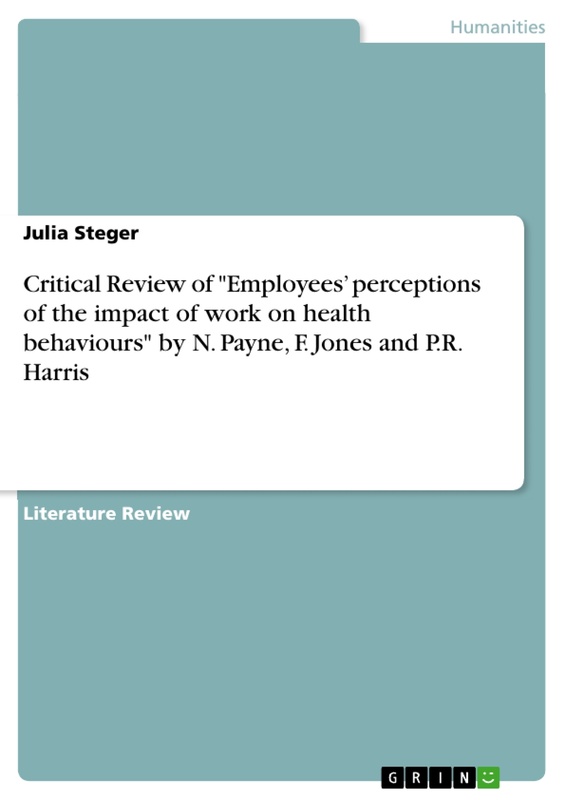 This paper will analyse the strengths and limitations of Peyne (Middlesex University, UK), Jones (University of Leeds, UK) and Harris’ (University of Sheffield, UK; 2013) qualitative study on the employees’ perceptions of the impact of work on health behaviours. The argument is going to be developed through a critical review of the journal article, focusing on the methodology used and its impact on the relevance of the results. Payne at al. conducted semi-structured interviews with twenty-four employees of the UK site of a multinational company acting in the computer hardware and software industry (main areas of work: design, marketing and sales). The researchers obtained information about the employee’s understanding of four defined health behaviours (namely smoking, drinking alcohol, exercise and diet) and how they are affected by their work. They identified four categories as the main themes affecting health behaviours, which are work environment, business events, being busy at work and work stress with various sub-categories. As there already is a broad range of both qualitative and quantitative research relating to work and health, which is a circumstance the authors are aware of, they list a number of reasons to justify the study. They point out that the study is able to provide a complete picture of the topic by the range of factors and key behaviours it observes, the bottom-up approach as well as looking at both positive and negative impacts of work. Payne, Jones and Harris conclude, that their study shows how work appeared to both constrain and promote healthy behaviour for different persons in different situations. They add, that employees are aware they sometimes only use work stress as an excuse for unhealthy behaviour and it’s not necessarily the main or only reason for it. First of all, the main strength of the paper, the high importance of the topic, must be highlighted and has to be described further. As the authors explain, work has a very important impact on different health behaviours, like smoking, alcohol consumption, a healthy diet and exercise, and therefore people’s overall health. With cardiovascular diseases being the dominating causes of death in the modern world (Kelly & Fuster, 2010), which can be influenced by a more healthy lifestyle, this is a serious and important topic that needs further intensive research. Although the topic of work’s influence on health is broadly researched, there is indeed little qualitative study, what backs the need for this certain research up. It is interesting that Payne et al. use the bottom-up approach and it should help them and the readers identify what all the topics really affecting employee’s behaviours are. Most studies manly focus on works stress (Cox, Kuk, & Leiter, 1993; Ganster, 1991; Nelson & Simmons, 2003; Ng & Jeffery, 2003; Quick, Murphy, & Hurrell Jr., n.d.), whereas this paper identified three other different occupation related themes that affect health behaviours. They, too, consider four different behaviours and do not concentrate on a single one. Therefore the results of the study - the four categories of work’s impact on employees - should give a good starting point for further research and thus implications for improving those behaviours. The authors describe and explain the existing research, both qualitative and quantitative, and the importance of the study in the first two parts of their paper (Payne, Jones, & Harris, 2013, pp. 887-889). The first thing to consider is the sample. Its size of twenty-four participants seems relatively small at first. However, considering the method (qualitative study, semi-structured interviews) and resources like time or access and comparing the size to other qualitative studies (Mason, 2010), the sample size might be subordinate and acceptable in this case, but still has room for improvement. A big problem of this sample size and the way of presenting the results (quotes with age and gender of the participant) is, that it is easily possible to identify individuals, especially for other managers and employees of the company, like line managers or colleagues. This lack of anonymity is very likely to affect the participants’ answers, as they won’t be speaking as freely as if being unknown. They might have reservations to speak completely truthful because they don’t want to be believed lazy or in any level addicted to alcohol. There is another source that influences employees’ replies, which will be discussed later. Even more important than the size is the quality and representativeness of the sample. From this point of view, it lacks a lot of substance: all employees are working in the same firm, country and sector and at that same company site. All are white-collar workers wherefore a certain higher education or academic degree is presumed. The participants differ from each other only in their internal variety, which, for itself, is rather diverse, including a random range of gender, age, specific job and the hierarchy level they inherent. The fact that the group of participants is so very specific affects the reliability of the study, as a different, more random choice is very likely to give different results. The behaviours described in the study are highly influenced by the company’s culture. Thus, other companies with other values in their culture might have another effect on their employees. And those vary even more between different sectors and industries, where employees may live completely different lifestyles. This makes it extremely difficult to generalise the given results. The problem described above can be defined as a sampling error, as the sample does not represent the wider population. Additionally, the participants were not randomly selected within the company but they volunteered themselves. This is another facet of the sampling error, the (self-)selection bias. Payne et al. address especially this issue in the limitations section of their article, next to listing the already mentioned sampling error (2012, p.897). They describe that employees who are willing to participate might be more interested in health behaviours than their peers or in sparing the time for the interview. A more random sample of the same size wherefore the participation is mandatory might therefore give more general results and might probably show a different level of awareness or interest in health behaviours. Because of all the above, the sample is very specific and the means of data generation could be seen as not very reliable. 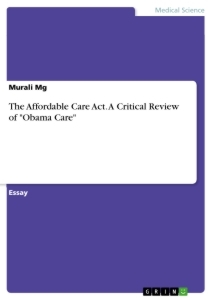 The authors, however, argue that the purpose of a qualitative study is not to be universal or general. Although a more random and reliable sample would have been desirable, there are reasons, why the overall themes and sub-themes are reliable, which will be described later on. The mere quality and reliability of the instruments of conducting and recording the interviews appear to be reliable and adequate in terms of the methods and procedures used. The content of the interview is not quoted exactly but clearly described, and appropriate recording and transcription tools were used. The semi-structured interview has in this case the most advantages over structured or unstructured interviews. It helps to cluster answers and covers all areas of researchers’ interest by starting with and including certain standard questions and topics to cover without constraining the interviewee. Thus, it leaves room for employees’ thoughts, which the researchers haven’t thought of during the design of the interview or helps the interviewer to tailor the question to the flow of conversation. Finally, the use of open- ended questions fits the authors’ bottom-up approach and openness towards new thoughts. Another rather general issue of the method is its vulnerability for response biases. As already described above, due to the fact that the interviews are conducted face-to-face and cannot be considered anonymous because of the small sample and detailed referencing of the quotes, the participants might not be completely truthful with their answers. Payne, Jones and Harris refer to this in the limitations section, describing that the employees might try to satisfy what they perceive to be expectations of the researcher or society. This is a big concern about that method, as it is likely, that people will not answer or speak completely freely or honestly about some topics, e.g. concerning questions regarding above-average alcohol consumption. However, it would be very costly and time consuming to use more accurate, objective methods (Strecher, Becker, Clark, & Prasada-Rao, 1989). A way to improve this will be described later. Consequently, here must be some doubts regarding the validity, as well. The data presents the views and perceptions of a certain group of people within this company. However, it might not accurately represent the social concept the authors want to examine in general, that is how employees perceive the effects of work on their health behaviours, due to its specific sample. 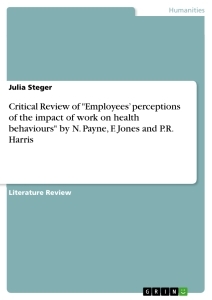 Secondly, as concerning external validity, Payne, Jones and Harris explain in their conclusion (2013, p. 897) that work may only be one aspect affecting health behaviour. They acknowledge that employees often use work only as an excuse to devote themselves to unhealthy practices. The study results are therefore only a very specific part of different impacts on health behaviour that might correlate and interrelate with each other. Future research needs to take this into consideration. Due to the mentioned concerns, the confidence to discuss the reported results is negatively affected at first. In comparison to their method of choosing a sample and conducting the interviews, however, the analysis seems to be sound. Payne, Jones and Harris used a method of evaluating their data with a thematic analysis based on Braun and Clarke (2006), whose model is widely used and referenced. 1 Although the concept of ‘reliability and validly’ is not accepted by some qualitative researchers, both measurements are going to be addressed in this paper. This is, because the framework can partly be applied to the qualitative study and is helpful to evaluate how sound the work is. Some evaluation will be based on Guba’s and Lincoln’s framework on how reliability and validity can be applied to qualitative research (1985).